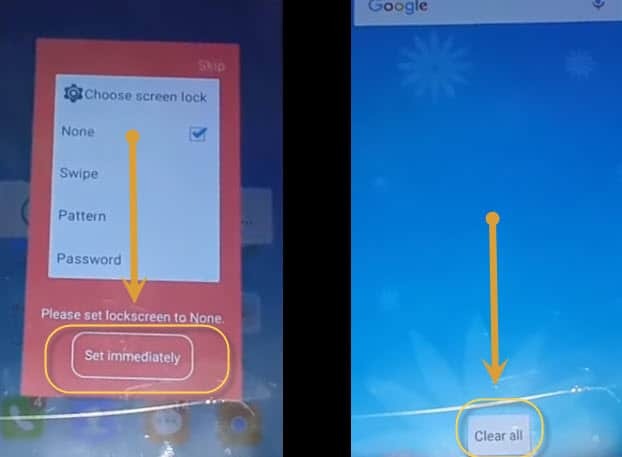 Remove FRP Panasonic Eluga Mark and Bypass Google Verification solution is available now, and the method of getting rid of this issue is very easy, you can complete to Remove FRP Panasonic Eluga Mark by just following below method. This Method is also working with 5.1.1 and 6.0.1 Anrdoid versions, and this method does not require any PC SOFTWARE, you can remove FRP Panasonic Eluga Mark easily. Remember, this method is for only device owner, not for thief person, if you are a thief, or you this device by wrong way, this is the enjoyment for you only in this world, hereafter you have to pay for this, you have to answer for this to your ALLAH. So don’t misuse of this method. Before starting this method, make sure you have “WIFI Connection” nearby, so that you could connect your Panasonic Eluga Mark through your WIFI. I am starting this method, from “WELCOME” screen, so just follow steps and match words with your screen to not be misguide while following this method. Step 1: From “Welcome” screen tab to “>” Next button, then tap to “SKIP” from “Insert SIM Card” screen, after that you will be on “Verify Your Account” screen, tap on the area where is written “Email or Phone”. See in your Panasonic screen KEYBOARD, there will be one symbol of “WORLD” along with “SPACE BUTTON”, long press on “WORLD Symbol” till pop up window appears of “Change Keyboard”, now tap on “CHOOSE KEYBOARDS”. 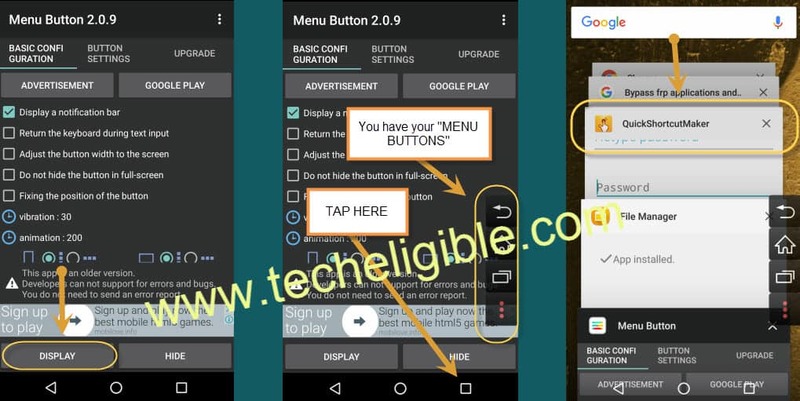 Step 2: Now you are in “Language and Input” screen, from there you have to tap on “OVERVIEW” button from your mobile, which is surely RIGHT button on your Panasonic screen, the overview button mostly we use to kill recent task. 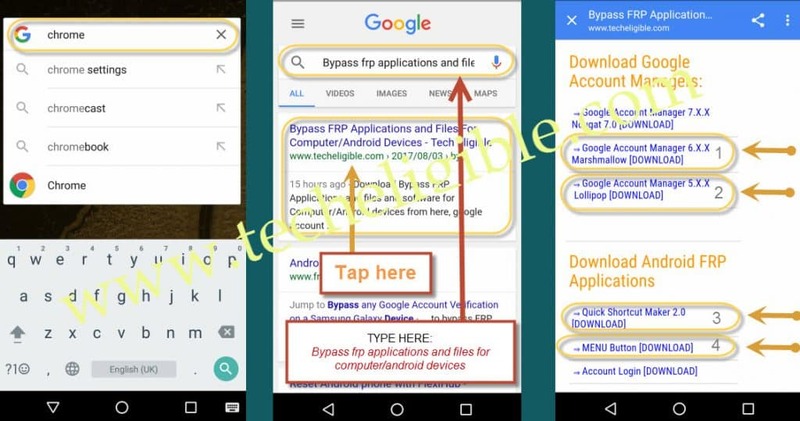 So tap on “Overview button”, then your panasonic Home Display will appear, from there tap on “GOOGLE Search bar”, type there “CHROME”, in the bottom of search you will have “GOOGLE CHROME Icon”, tap on that, to open google chrome, then search there “Bypass FRP Applications and Files For Computer/Android Devices“, 1st search result will be of “Techeligible.com” site with same title which you typed, just tap on that to open that website result. Step 3: Download these all below applications from there. Once your all downloading application finish, tap on “Overview Button” again, so that you will be able to see “Google Search bar” from your Panasonic Eluga Mark Home screen. Tap on “Google Search bar”, type there “File Manager”, tap on File Manager icon, and then tap on “Apps”. Step 4: Once entered in “Apps”, there will see all your downloaded applications, those you downloaded before, if you have android version 5.x.x, so Install “Google Account Manager 5.x.x”, if you have 6.x.x, so install “Google Account Manager 6.x.x” for that. Warning: If you get an “Installation Block” popup, so from that popup window tap on “Settings”, then enable “UNKNOWN SOURCES”, then go back to “FILE MANAGER APPS” and install your google account manager from there. -Tap on Google Account Manager > Install > Done. Now go back to same application folder, so that you could INSTALL “Quick Shortcut Maker” as well. -Tap on “Quick Shortcut Maker” > Install > OPEN. 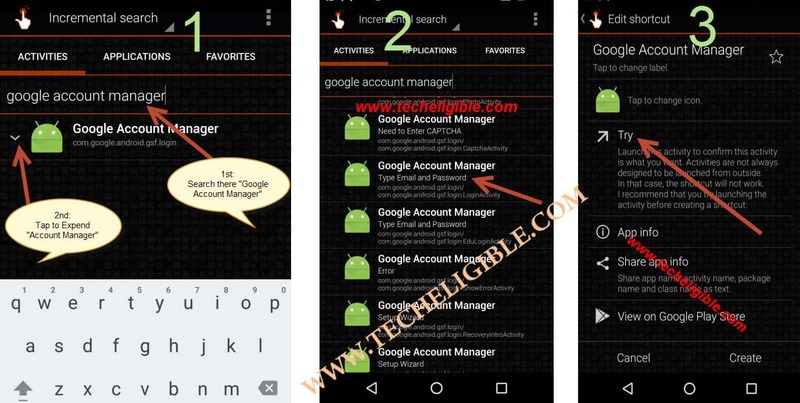 Now you have successfully reached in Quick Shortcut Maker, type there in search bar “Google account manager”, and tap on google account manager to collapse down, and then there you will see list of google account managers, select one google account manager the one with “TYPE EMAIL AND PASSWORD”, tap on that one google account manager, tap on “TRY”. If you don’t have “3 Dots” top right side corner of your screen, so TAP on “Overview Button”, and open “File MANAGER”, in where you have your all downloaded apps, tap on “MENU BUTTON” apps from there to install, once installation finish, tap on “OPEN”, to open that MENU APPLICATION, and then you will be inside “MENU BUTTON”, tap on “DISPLAY” from there. It’s time to go back to quick shortcut maker again, tap on “Overview Button”, then select “Quick Shortcut Maker” task to open. Step 5: Tap on “PASSWORD” area, after that tap on “3 Dots” from bottom right side corner, then tap on “MENU BUTTON IME”. Then you will surely have “Browser Sign-in”, in the bottom or top of your mobile screen, tap on that to open. Enter your any “Valid Gmail Account” to Remove FRP Panasonic Eluga Mark, and sign in there, once Signing in done, Restart your device by holding “Power Button” then tap to “REBOOT”. Tap on “>” this go for next from Welcome Screen then > Skip > Next > Next > Next > Skip > SKIPANYWAY > MORE > MORE > NEXT. Now you can hard reset your phone by going to > Settings > Backup & Reset > Factory Data Reset > Reset Phone > Erase Everything. Congrats, you have successfully done to Remove FRP Panasonic Eluga Mark. If you liked my this post, don’t forget to say “THANKS” below.